4 Ingredient Healthy Peanut Butter Granola Recipe (Vegan, Gluten-Free) – Easy & Homemade! 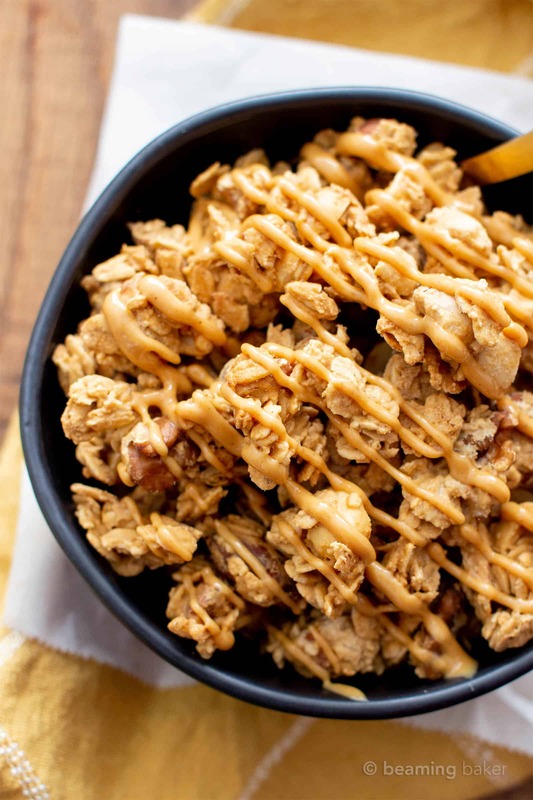 This homemade peanut butter granola recipe is so easy & healthy! It’s crunchy with big clusters, salty, sweet and vegan, gluten-free, protein-rich, oil-free! 4 grams of protein per 1/4 cup! Back in the day, before I could truly appreciate all the glory that is peanut butter, I’d read about folks eating entire jars of PB in one sitting. Woah. But now that I’m a fellow PB fanatic, I now consider that idea strangely enticing. If only I could figure out a way to eat that much peanut butter and not have to run 500 miles afterward, then dissolve into bed for 3 straight weeks after. 4 Ingredient Healthy Peanut Butter Granola Recipe!!! Anyone as excited about this as I am? This homemade pb granola is soon-to-be your favorite way to enjoy granola and peanut butter in one fell swoop. So you (and I) can avoid the whole “eating 1 entire jar of PB, then having to run 500 straight miles afterward” fiasco. Let’s dive in! 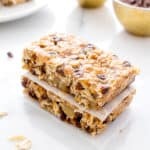 In today’s post, I’m going to be covering common questions about peanut butter granola (and bars! ), substitution notes, tools for making this pb granola awesome and more! Use creamy, unsalted natural peanut butter. It should be drippy and runny, like a thick liquid, and made with just 1 ingredient: peanuts. Here’s a homemade peanut butter recipe to try. 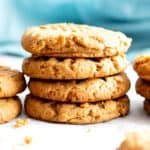 Avoid chunky or salted PB: the peanut bits in chunky PB mess with the wet to dry ratio in the recipe. 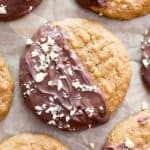 Salted PB takes away how much salt you choose to add to the recipe. Create clusters before baking! See next section for more. Cool completely before storing to ensure crispy pb granola clusters. 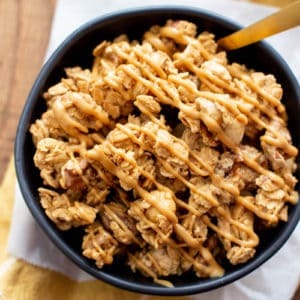 How Do I Get Big Clusters in My Homemade Peanut Butter Granola? Before baking, create small piles of pb granola on the sheet. Keep the pb granola clusters somewhat chunky, but not too large, as they’ll fall apart when flipping. Space each pb granola cluster about ½” apart to allow air to flow through and crisp up clusters. Very gently flip the clusters during the midway bake point. If the clusters start to fall apart (and the clusters aren’t too browned), bake for another few minutes before flipping. 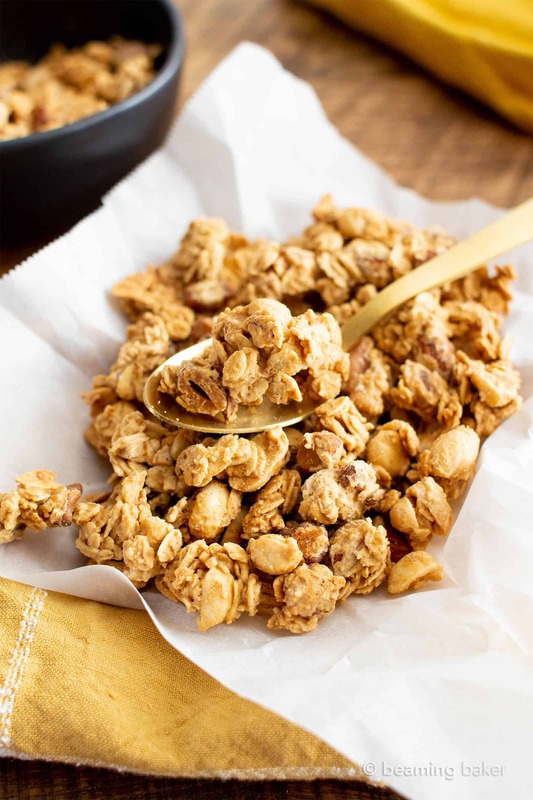 Two big cluster lover’s recipes: homemade chunky paleo granola & this sweet ‘n salty nut clusters recipe. 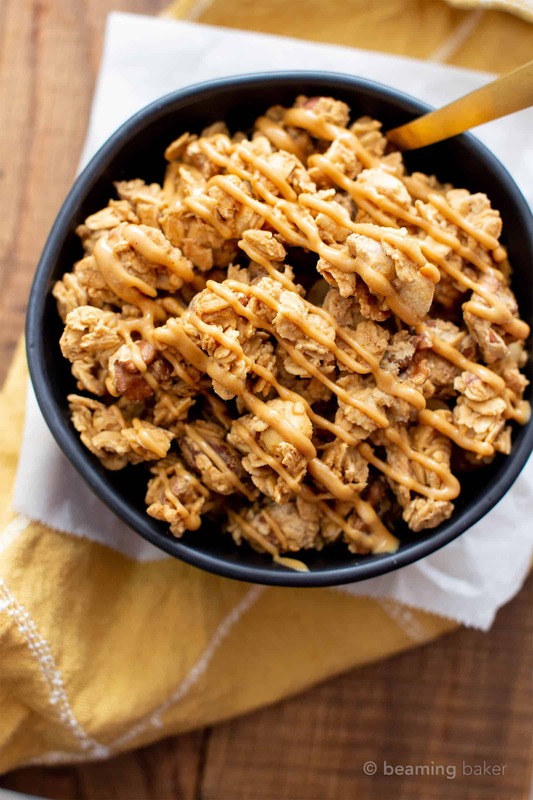 What Kind of Substitutions or Swaps Can I Make in This PB Granola Recipe? Can I swap the peanut butter for another nut or seed butter? Yes! Almost any other kind of nut or seed butter will work, including: almond butter, sunflower seed butter (aka sunbutter), cashew butter, and more! 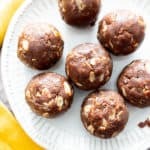 How to swap nuts, change add-ins: feel free to swap the peanuts in this recipe for your favorite nut, dried fruit (just make sure they’re not too huge) and more! Using other sweeteners: brown rice syrup, date syrup, honey. Different sweeteners will yield slightly different results. 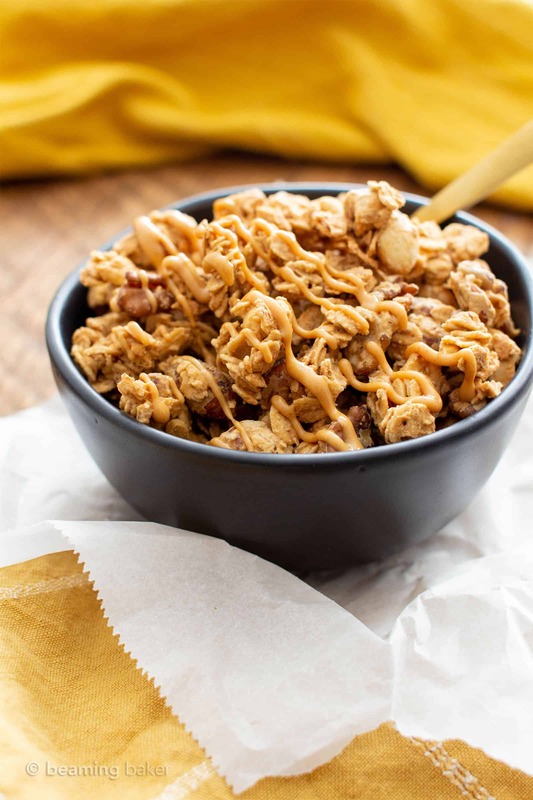 This peanut butter granola recipe isn’t too risky, so for the most part it should work just fine! 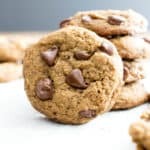 Did you make this recipe? 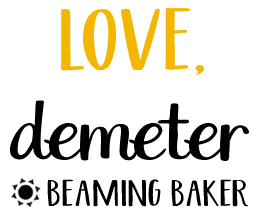 Take a pic and share it on Instagram with the hashtag #beamingbaker and tag @beamingbaker. I would love to see it! 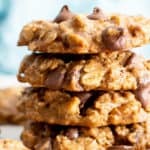 4 Ingredient Healthy Peanut Butter Granola Recipe (V, GF): this homemade peanut butter granola recipe is so easy & healthy! 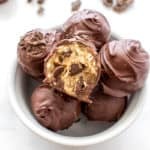 It’s crunchy with big clusters, salty, sweet and vegan, gluten-free, protein-rich! Vegan, Gluten-Free, Dairy-Free, Protein-Rich. Preheat oven to 325°F. Line a large baking sheet with parchment paper. Set aside. Add peanut butter and maple syrup to a medium bowl. Whisk until very well incorporated and smooth. Add nuts, oats, and salt (if using). Using a rubber spatula, stir and fold until well mixed. Pour onto the prepared baking sheet. Using the spatula, gently nudge granola into an even layer. Separate granola into small piles to create clusters. Make space between clusters to allow for air to flow through and crisp up the granola. Bake for 20 minutes. Using a heatproof spatula, gently flip granola, making sure to keep clusters intact. Bake for an additional 5-15 minutes, until edges are a deep golden brown and granola is just slightly soft. Mine took a total of 27 minutes. Granola will crisp up while cooling. Place baking sheet on a cooling rack. Allow to cool for about 30 minutes, or until completely cooled. Enjoy! Storing instructions below. Also try my Chunky Paleo Granola (with big clusters!! 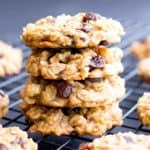 ), amazing Healthy Low Calorie Granola and my incredible Oil-Free Peanut Butter Oatmeal Breakfast Cookies! - Store in an airtight container at room temperature for 1-2 months. - Nutrition Information: is an estimate based on the best-selling, most common brands per ingredient. Also, it's estimated based on 14 servings per recipe & made without salt. ???? Click the links below to check out my favorite tools & ingredients used to make this recipe. Baking Sheet – Sturdy, great value and my favorite to use! 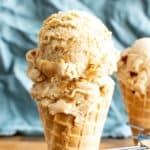 Natural, Unsalted Creamy Peanut Butter -my favorite peanut butter to bake with (and eat!). Unbleached Parchment Paper – great alternative for those who want unbleached parchment! Pure Maple Syrup – Such a great quality and amazing taste. 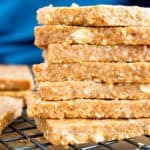 Previous Post: « 3 Ingredient Paleo KIND Bar Recipe (Vegan, GF) – Easy DIY Homemade KIND Bars! Pinned this one! I haven’t made homemade granola for ages and this sounds so good! I know my kids would love it too. Woohoo! I think they’re definitely gonna love it Jennifer! ???? I am first in line for your gorgeous granola! My daughter has peanut allergies and for her growing up years, we just didn’t keep it in the house. She’s graduated and gotten her big girl job, so peanut butter is a happy member of the family again! Yay! So glad to have you as line leader Lisa! ???????? LOL and I’m doubly glad that you’re able to welcome PB back to the fam! ???? I love this as a snack or even as a simple dessert. Very flavorful and very satisfying. Thanks for this one! Throw granola is definitely tasty as a dessert! ???? You’re welcome Mike! Yum! I eat yogurt for breakfast every day but often want some more crunch – this looks like the perfect topping. Love the tips on getting the big pieces of crumble. Oh yes, this is absolutely amazing on top of yogurt! ???? Hope you enjoy those big clusters! It’s seriously such a tasty combo! ???? Whoa! I had no idea how easy this was to make at home! I can’t wait to try this! Yes! It’s super easy, and so fun! ???? I am truly a peanut butter lover so I totally get your obsession. This looks like the perfect way to satisy my cravings. Haha yes! Glad to know you’re a fellow PB lover! ???? Perfect way to get some good protein !! Oh you know it! ???????? Yaass! It’s so easy, and soo tasty! ???? Your photos are AMAZING! Seriously so pretty and I love that this granola is only 4 ingredients! Pinned and sharing as my feature for this weekend! Aww you’re too sweet Chrissie! ☺️ Thank you so much for sharing! I would like to wake up with this! Looks perfect for a wonderful day starter! It’s most definitely the best way to kick off the day! ???? My favorite breakfast! I love how packed with peanut butter this granola is! It’s super packed, and oh-so-tasty! ???????? Peanut butter granola is my FAVOURITE! Same here! ???? Thanks Marsha! Amazing, delicious, thank you for recipes ???? Yay! You are so very welcome Jurgita! ??? ?